Every non-profit has a need – but this doesn’t quite cut in in today’s environment, it’s not enough to persuade a donor to give to you. A few weeks ago @brownrach wrote about what motivates your donors to give to your organisation. This segues quite nicely to exploring that today’s donors seeing themselves as investors – not only are they investing in your organisation, they are investing in improving people’s lives. So if you can articulate these messages though testimonials, real-life stories and statistics via your publications - how you have been directly improving people’s lives you have a much greater chance at building long-term relationships with your donors. 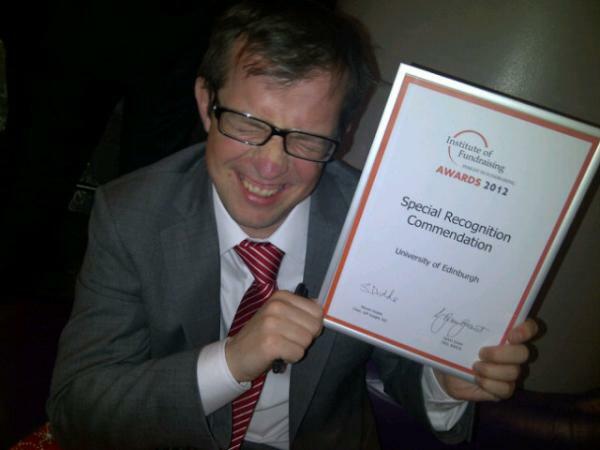 IoF Insight Awards - Congratulations Paul! 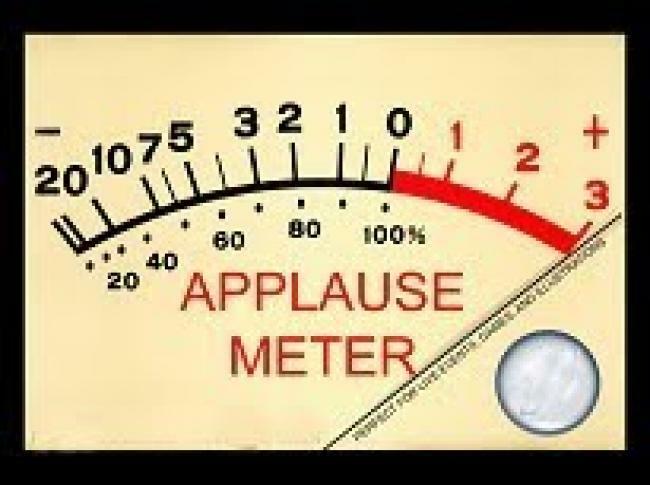 Today's post is dedicated to giving a BIG Collectivist round of applause to Collectivist Paul who today won a Special Recognition Commendation from the Institute of Fundraising's (Insight Special Interest Group) inaugural Insight awards ceremony for his pioneering work in data modelling. Paul's work has changed the way in which the University of Edinburgh's fundraising operation does its business - and all for the better. Collectivist Paul - we salute you! Sometimes a charity says thank you, and well, you can just tell that they really mean it. I got one such thank you letter last weekend from Kids Company. I was so touched by your generous donation of £25. Fundraising has become even harder. I find myself working late into the night seven days a week just trying to generate resources for our kids. So when donations like yours arrive believe me I bounce off the ceiling with delight! Your help means so much to all of us who work at Kids Company, because we become a witness to your kindness but also to the positive impact it has on the children’s lives. We’ve just opened our exhibition at the Royal Academy, Childhood, so I’m hoping we can encourage more of the public to donate. One of the girls exhibiting was living on the streets since the age of 12 having run away from home where she was being sexually abused. When she arrived at Kids Company she was so undernourished, looking like a 12 year old, despite being 17. She hadn’t been to school since she was 10 but we found she wrote amazing poetry so we sent her to Goldsmiths University for an interview and they’ve offered her an unconditional place on the creative writing degree course. Before our eyes has emerged a young girl who is glowing and full of hope for the future. It’s for children like her that your unique support is precious and powerful. Thank you for kindness that touches the heart. So what do you think? 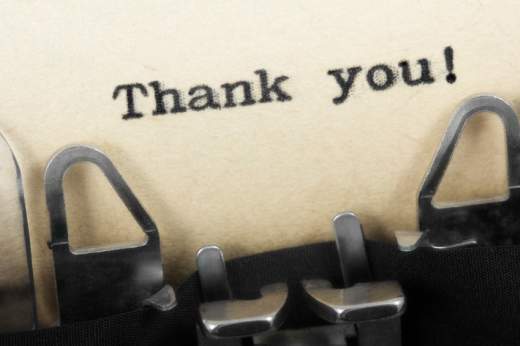 Would your organisation’s thank you letter stand up against this? I know that this is a mail merged letter – but it is still brilliant, personal and touching. I want to give again. As we have talked about before, donors are the most precious resource a charity can have. Just in saying thank you well, this charity has made me feel like a critical part of their mission. Now we must make our donors feel the same way. Baby boomers are those born between 1946 and 1964, some are now over 60 – which is prime time for volunteering. Some want to add a meaningful 'third act' to their lives, getting involved with communities and charities which fit their needs. Baby boomers also exhibit many characteristics that make for great volunteers. Many are wealthy, healthy, educated and curious, and want to give something back. They have skills, ideas and contacts. They want a crack at saving the world - making a difference. Philanthropy will be their way to shape the world and be the change. The population of the UK is growing in size and becoming increasingly older. Between 1985 and 2010, the number of people aged 65-and-over in the UK increased by 20% to 10.3 million. In 2010 17% of the population were aged 65-and-over . Many of these people are not looking for things to buy but looking to give something back. 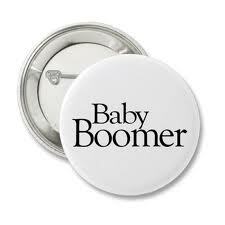 David Eisner, ex-CEO of the Corporation for National and Community Service, said at a White House Conference, "America’s baby boomers are an untapped resource of extraordinary proportions. They are the largest, healthiest, best-educated generation in history – and they can leave an incredible legacy through service to others,". Why aren't we picking up the phone to them? Direct volunteering interests include teaching and mentoring, collecting and preparing food. Indirect volunteering interests that boomers typically like include fundraising, professional services and general work. Boomers are more likely to volunteer with more than one organisation, whereas the average volunteer usually invests time with one organisation at a time - they can volunteer in several capacities. Strong community ties increase volunteering. Baby boomers are more likely to volunteer as part of a social interaction. The main reason for boomers to volunteer is being asked by someone they have an established relationship with. Volunteering tends to peak at mid-life, around the current age of baby boomers. Don't let high powered people do low level work. They are longing to do meaningful work so don't have them licking stamps! They are smart people - use their skills. Trawl your database to find people with specific skills relevant to your needs and match them up. Build small teams e.g. a Social Media group, a Strategic Planning group, PR and Communications group, Young Leaders group, Women's group etc. Your non-profit organisation cannot afford to miss out on the volunteer possibilities that the baby boom generation can provide. I'm going to let you into a fact not many people know. 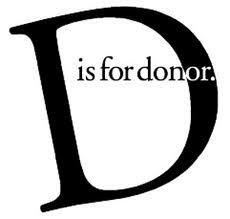 Major donors are humans too. Moreover, chances are they are alumni at a university for which you are fundraising, chances are they had a similar experience of university to other alumni in their year. Chances are, therefore, they might enjoy reminiscing about those experiences. Talking to students. Wandering around their old haunts. Sometimes, we're at risk of forgetting that. In our rush to make our approaches bespoke and exclusive we discriminate against the very people with whom we want to build relationships. God forbid that a major donor prospect should receive a cash appeal. God forbid that a major donor prospect should be included in the telethon. I'd like to challenge that. Telethons and cash appeals can be used as major donor cultivation tools too. Really, they can. And so can telethons. We spend a lot of time crafting direct marketing appeals. We work with agencies on coming up with the most appealing and emotive way to convey our cause. We think hard about how to communicate those messages. And then we don't share them with the people who are our closest friends. Shylock agrees with me - do you? Why not send your latest DM piece to your major donor prospect with a personal note saying you're really proud of the piece and would love to know what they think about it? Why not drop a line to your major donor prospect to let them know that the telethon is taking place and you've arranged for them to be called by a student? Why not let them know you would love them to take the opportunity to talk to the student? And ask them to let you know what their experience was like? If you are setting up an experience for your other supporters which is designed to be enjoyable and to engage them with the life of your organisation, don't deny that to your major donor prospects. Include them in it and let it help it to deepen your relationship. It's an annual appeal, or a telethon. With increasing pressure from cuts in government and local authorities, many non-profits are focusing their attention on seeking funding from grant-making trusts and foundations. As a result of this, most trusts and foundations are over-subscribed; receiving more applications and proposals than they are able to fund. Although many may be receiving more applications than ever before, many of them are still keen to give all the support they can to the right organisations and the right projects. The key is to ensure that you ask the right funders for the right amount in the right way. If you are able to demonstrate that funding your organisation or your project represents the best use of their charitable funds, then you are almost there! The estimated total number of trusts and foundations in the UK is 8,800. CAF monitors the top 500 trusts and grant making charities in Charity Trends (as ranked by their grant making expenditure), and their grant making of just under £3 billion* last year represents about three quarters of the value of all charitable grant making, and 10% of the UK voluntary sector’s income. According to the Ross Case Survery Universities received slightly less income in 2010-2011 from Trusts and Foundations than previous years. 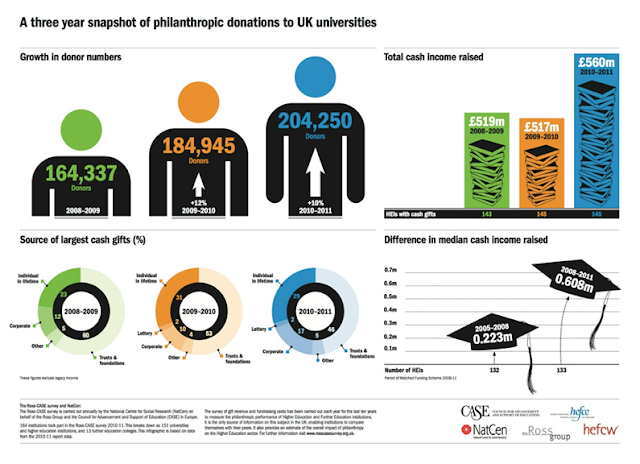 Take a look at some case studies – what and how much they give to – annual reports reveal a lot! What’s the impact / public benefit? 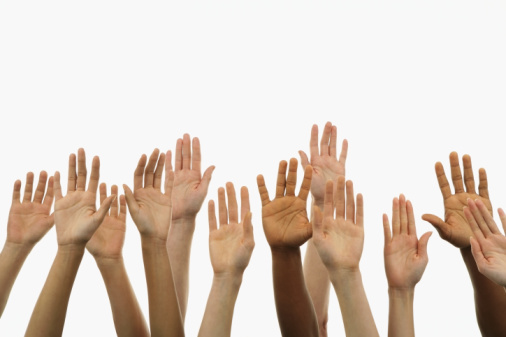 Will your project engage new people? Every now and then in the world of fundraising something comes along that makes me jealous. Green eyed, sick to the stomach, filled with envy jealous. Because it's cool. Because I wish I'd thought of it. However, being a friendly sort of creature I don't start boiling up the hemlock, I start shouting about it from the rooftops. Because if I'm jealous, it means I'm a fan. This week the object of my envy is the University of Dundee. A couple of weeks ago, I heard Dundee was fundraising for a morgue. I sighed and felt sorry for Dundee. A morgue? They must be insane. How would you fundraise for a morgue? And then I saw this. And it just about took my breath away. Academia is all about pushing the boundaries, breaking new ground, reaching for blue skies and turning the world upside down. Academics are rebels. Free thinkers. Outside the box creatives. However, sometimes it seems that as much as academics rebel, we professional services like to play it safe. Sometimes it seems like we're a little scared of taking risks, scared of dumbing down or being irreverant. But in an increasingly crowded market place that brings problems. Pick up the case for support for most leading UK universities and you will see the same sorts of projects featuring in their fundraising campaign. Libraries, medical schools, scholarships. We aspire for excellence, we want to attract the best and brightest... sound familiar? Not the most appealing of images. But Dundee is an international centre of excellence in anatomy and human identification. It's dead good (if you'll forgive the pun). And at the heart of that is a morgue. A really good morgue. Or there will be if Dundee can raise enough money. So Dundee have chosen to be bold. In a crowded market place full of excellence and aspiration, pictures of smiling students and shiny buildings they've gone gritty and mass market. They've got a campaign that looks like a crime novel (an immensely popular genre). They've got crime writers on board to back the campaign. They've got a really inventive community fundraising initiative (bid to name a corpse). It's intriguing. It's funny. And most importantly, without apology it dives straight to the heart of the case for support. And it reaches out beyond the alumni base. Diversification. I like that. Once I stumbled upon Million for a Morgue I wanted to find out more. And then I wanted to tell people about it. In my last post I said that fundraising is about more than raising money, it's about transformation. It's also about profile, about engaging and about reaching out. Now I've got over my jealousy, I want to slap Dundee on the back and raise a toast in celebration of daring to be different. And I wish them a million pounds of success - they darn well deserve it! Excuse me, can I ask you a question? Why do your donors support you? No, really – why? Do you have an idea in your mind as to what motivates your donors to give to your organisation? A charity DM insert fell through my letterbox this weekend, and it’s made me realise that I don’t entirely know why donors support my organisation. Let me explain. You may have seen something similar. 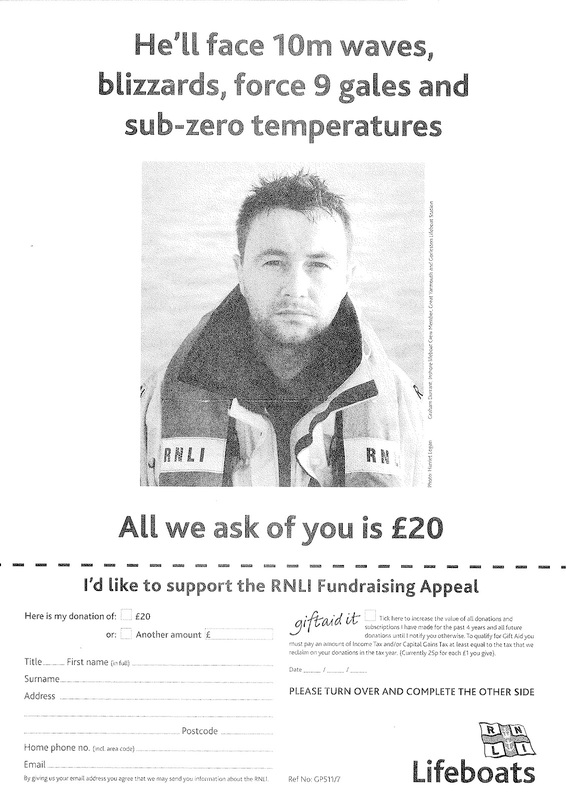 It’s for the RNLI – the ‘lifeboats’ and it features one of their volunteers. ‘All we ask of you is £20’ it proclaims. 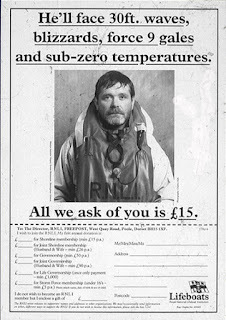 A spot of digging on the internet and I discover that this is basically the same advert that the RNLI have been using for 20 years. Here is the version from the 1990s. Ok, so the wave size has gone metric and we’ve had a slight increase in the donation amount, but I think you will agree they are much of a much-ness. One would hope that if they’ve been using the exact same concept for 20 years – it works. And this is where it gets interesting. This is where it is crucial that the RNLI knows what motivates people to support them. The RNLI’s mission is to save those at peril on the seas. This 180 year old institution has more than 200 coastal stations around the UK, manned by volunteer lifeboatmen and women who launch crafts into the sea to provide emergency rescue to those in danger. For 150 years of their 180 year history, the RNLI assumed that the reason people supported their work was because of the lives they saved. Those people who had got into difficulty on their boats, whose yacht had capsized, who’d been swept out on their surfboards. They saved thousands of lives a year – and that was why people gave to them – right? The RNLI carried out some research. Whilst it might be a little harsh to suggest that donors couldn’t care less about what happens to those at peril in the seas, what the research revealed was that this was not people’s motivation to support. No, people were supporting the RNLI because of their volunteers. The hero men and women, who give their skill, courage and time to rescue people in trouble. They are ready to save the life of anyone – to risk their own lives – whatever the conditions and at any time of the day or night. And so that, I imagine, is exactly why we see an RNLI volunteer on the fundraising piece. And that is why we've seen him (in various guises) for the past 20 years. I hope it is becoming clear what a useful tool understanding your donor's motivations can be. If the RNLI had continued to go with their instinct, these pieces would contain the stories of those they had saved – not the ones doing the saving. So I’m going to go and ask our donors why they support us. And maybe the test of us really understanding will be that we’re still using the same message in 20 years’ time. When I began my fundraising career, people spoke over and over about ‘the pipeline’. I had no idea what it was but quickly learned that pipelines can be an incredibly valuable tool for understanding prospecting, cultivation, asks, stewardship and reporting. 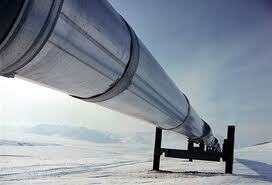 So, what do we mean by ‘the pipeline’? The pipeline shows prospects being cultivated and how close they are to giving. We can also have donors in the pipleline – it’s includes everyone who we expect to give to our organisation. With each step there will be a number of prospects / donors affiliated – and this is the pipeline. Usually there are many more at the identify stage than the stewardship phase. As fundraisers we often attach a prospect strategy to each step of the pipeline – so, those at the beginning of the cultivation stages will take much longer to develop into donors than those at the ask stage. Having this pipeline information is helpful for both short and long term income forecasting. Since a pipeline is able give a good synopsis of the number of donors being cultivated, it is helpful for prioritising where our efforts should lie. If our fundraising targets for this year is likely to be met - the priority needs to be moving prospects along from the identify and research stages towards cultivation and an ask. This also can be said for the reverse order. How many prospects in the pipeline will we solicit in the next 6 months? In the next 12 months?Will our projects meet our short and long term fundraising targets? Assigning likelihood or confidence ratings to prospects can be helpful in managing expectations from senior management or your board when reporting on your pipeline. I recently attended a meeting of prospect researchers from various organisations from across Scotland and at that meeting two things became apparent. Firstly, I was the only data analyst in the room (well really I was the only one that thought of themselves that way) and secondly there appeared to be great interest in what data analysis could bring to the traditional role of the prospect researcher. In particular there was a real enthusiasm to learn more about predictive modelling. With this in mind I thought it would be useful to put together something about getting started with using data to build a predictive scoring model. Even a simple model can produce fantastic results when applied to appeal mailings or telephone campaigns. What is a scoring model? The idea is that if you find those that look like your donors, you will have a better chance of producing more donors. To do this you gather together different data variables about your constituents. When you find a variable that has predictive power you allocate it a point. When you combine multiple variables together and the points are added, you produce a score, the higher the score the more like a donor the constituent is. What gives a variable predictive power? I have been asked many times what the average donor looks like. Who gives to this fund or that? Just because the characteristics we study relate to donors does not make those characteristics predictive. To build a scoring model we need to uncover distinguishing characteristics not common characteristics. How populations differ from target groups to random groups is far more interesting statistically. The crucial distinction is that we are not looking for similarities between our donors. We are looking for distinguishing qualities between our donors and the rest of our constituents. The average donor may look very similar to the average non-donor. From a sample drawn from my general population I looked at two variables, whether or not a legacy has been pledged and whether or not an email address exists. Firstly I looked at the 8% of my sample that are donors. 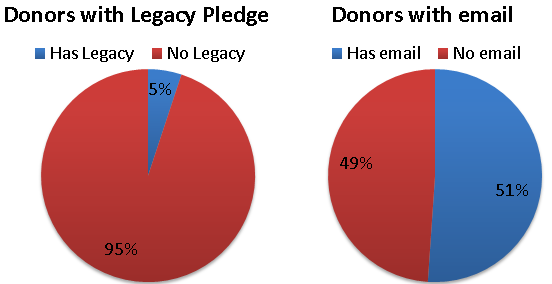 I found that very few donors have pledged to leave a legacy while a majority of donors have an email address recorded. In fact a little over 1 in every 2 donors has an email address recorded. Does this give email address more predictive power? Looks like 1 in 2 chance of finding a donor with email. Right? The simple answer is well, we just don’t know. There still isn’t enough information for that. Remember we need to look for what distinguishes a donor from the rest of our constituents. When we look at our sample from the perspective of the data variable and look at donors with non-donors things change. Email is no longer the significant variable. 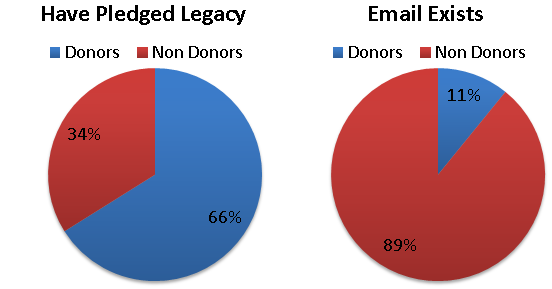 The vast majority of those with email are non-donors whereas the opposite is true of those that have pledged a legacy. You have a two in three chance of picking donor if you focus on those with a legacy pledge. When we looked at donors alone, it seemed like we had a 1 in 2 chance of finding a donor if we looked at the email variable. When we look at the bigger picture we see that it is more like 1 in 10. Don’t look at donors in isolation. Compare data for donors with data for everyone. You need to repeat this test for other variables to find out those with the strongest predictive power. You could try starting with event attendance, employment details, questionnaire responses, email address, legacy pledge status as well as age, relationships and location. Once you have collected your variables you need to determine how many to use and which are significantly higher than the baseline (the percentage of donors in your sample as a whole). For my sample of 10,000 records I found a baseline of 8% donors. Focusing on legacy pledgers as a distinct cohort, the percentage of donors is nearly 8 times higher. Aim to keep the number of variables low. 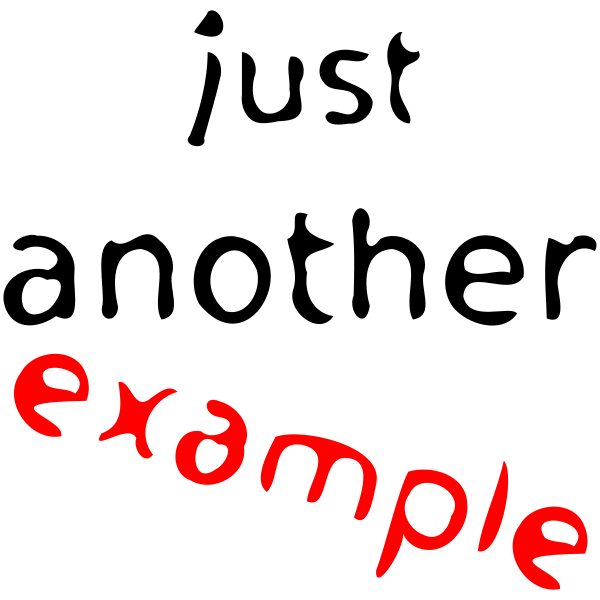 Try finding up to 10 variables that show higher rates of giving than your sample baseline. Any final model can still be effective with as little as 6 variables combined. That’s enough for now. Part 2 will deal with tying this together and reporting the model output. A couple of weeks ago, I posted a blog on Top Tips for Fundraising in Our Times and pointed out as with all sales the most likely person to give is somebody who has given before. Rachel posted a blog earlier in the week on renewing and retaining donors but do we realise the treasures our databases hold? Your database is a goldmine of information. I know we don’t all have Analytics Wizards but we can use simple approaches to 'mining our databases'. · When your donors give – weekly, monthly or annually? · How much they give – same, varying or increased amounts? 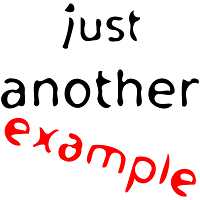 · Is their gift in response to an appeal, a meeting, a newsletter, news article etc.? Whatever the reason for giving, most of these donors that give time and time again, want your organisation's attention. They have their hands-up, they are making gifts and want to make that personal connection with you. Pick up the phone, call the donors, thank them for their gift, and don’t be afraid to ask them what it was that motivated them to give to you. Donors always appreciate a call and it makes them feel their gift / giving is important to you. If you don't have fundraising software keep accurate records of this and develop your prospect strategy. Keep up your personal contact with them. Ask them to meet for a coffee and find out more about them and their interest in your organisation. This will help you build up and expand your prospect pool. Through meeting them and cultivating them, in time it will move donors from giving small amounts into giving more, or dare I say it, into a major donor. One of the greatest human cravings is to feel appreciated – by not doing anything you are suggesting that you are taking people for granted and we don’t want that perception! 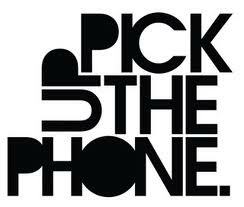 Do what it says on the picture below, make that call and build your prospect pools! Welcome lovely visitor, I hope you enjoy reading the views and thoughts of the Fundraising Collectivists. Please note that our posts reflect our personal views and experiences, not those of any of the organisations with which we have worked.